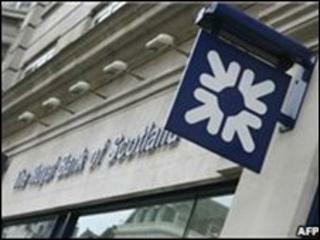 Royal Bank of Scotland has said it is to cut a further 2,600 UK jobs over the next year. Most of the losses are in its insurance division, with 600 posts going at the head office of its retail banking arm. The bank has been trying to cut costs since the massive government bail-out to save it from collapse in 2007, which left RBS 84%-owned by the taxpayer. It had already announced almost 20,000 job losses across its business worldwide since the bail-out. As part of the overall cuts, some 500 workers stand to lose their jobs in Edinburgh and Glasgow, according to the Scottish government. RBS said it would try to keep compulsory redundancies to an "absolute minimum". "We are working hard to rebuild RBS in order to repay taxpayers for their support and having to cut jobs is the most difficult part of this process," it added. "We have strived at all times to be open and honest about the tough choices we are making." RBS's insurance arm includes the Direct Line, Green Flag, Churchill and Privilege businesses and employs 16,000 people. The retail banking roles will mainly be cut from headquarters in Edinburgh and London. As part of its bail out, RBS is to sell some of its businesses, including its branches in England and Wales - originally Williams & Glyn's - its NatWest brand in Scotland, RBS Insurance and Global Merchant Services, its card payment business. The sales have been demanded by the European Commission to safeguard competition concerns after RBS received the state aid.